"With a pick-up location at Four Winds Farm in Peterborough, Monadnock Region residents are able to gain access to some of the freshest seafood through their community supported fishery (CSF) program, which offers a “catch of the week” fish to be picked up every week." " “It’s good to see a movement like this where everything is going right back to the restaurants again,” Driscoll said. Driscoll said in years past, his products were always sent to Boston, New York or overseas. “When it sells locally, that’s pretty cool,” Driscoll said." " I love the fact that we are getting it right off the boats. I want it right from my coast. I want to know where it came from. We've met the guys who are pulling these fish out of the water, so it's great to know what hands your fish have touched and who's making the money..."
Louis says it’s up to local restaurateurs to do what they can to support the fishery. New Hampshire Community Seafood is a multi-stakeholder cooperative that includes both fisherman and seafood consumers. Through this cooperative program established in 2013, 15 fishermen and 215 consumers work together to harvest, process and deliver locally caught seafood to nearby communities. Last year alone, the program provided over 40,000 pounds of fish through weekly delivery to 1,000 members at 20 drop-off locations and provided fish to 21 restaurants throughout the state. The benefits of this program, and others like it, are ecological, economic and emotional. Fish are purchased at the docks for higher prices than are realized through traditional markets allowing local buying power to stay local. Ecological benefits are realized by providing higher value for all fish, allowing fishermen to receive higher profits for less fish, and for lesser known species, like pollock, Acadian redfish and spiny dogfish. These underutilized species are locally abundant but usually command low prices through traditional markets. Through this innovative approach, New Hampshire Community Seafood is making strides toward a system that supports both fisherman and fish. 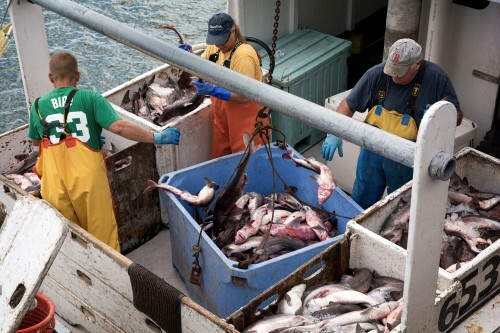 Some of the greatest benefits of the program are from the connections made between fishermen and seafood consumers. Reestablishing this important connection, which has been lost over time, is restorative for all involved. The fishermen love to meet and talk with people who eat their fish, and consumers love meeting and learning from the people who catch their fish. By making these connections, New Hampshire Community Seafood is improving awareness and understanding of fishing practices and their impacts, and of the science, management and markets that shape our fishing culture. 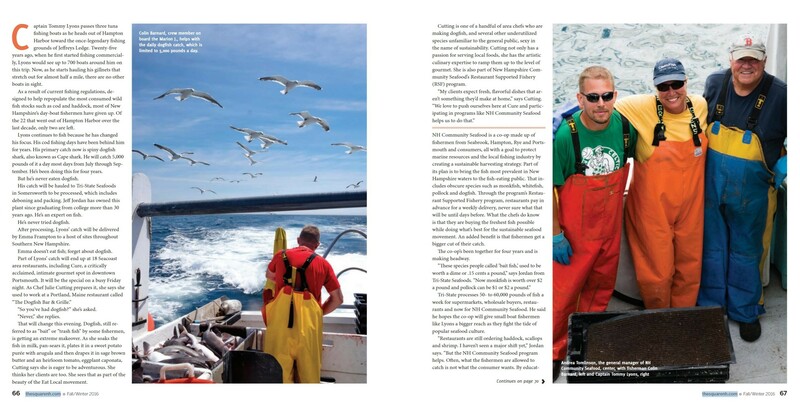 In the last issue we took a look at the amazing work being done by UNH and NH Sea Grant and their raising steelhead trout, kelp, and mussels, and though the virtues of the fish themselves swam prominently to the forefront, a crucial aspect of their endeavor calls for reiteration: providing an environmentally sound way to sustain not only the ecosystem but especially the local fishing economy and the diminishing group of men and women that keep the tradition alive. New Hampshire's seacoast, like much of New England, was built on the success of local fisheries. Andrea Tomlinson of New Hampshire Community Seafood explains how the availability of local, sustainable seafood helps preserve this important piece of our culture and bolsters communities up and down the coast. Michael Chambers is a farmer of sorts, and his farm is in the sea, a modest floating plot of aquacultural plenty near the mouth of the Piscataqua. Here, on a 14’ x 14’ platform constructed of HDPE pipe, rope, simple metal rails, and a narrow plank walkway, Chambers oversees what could potentially be an exciting and lucrative addition to New Hampshire’s momentous local food movement. As part of an innovative initiative to foster both economic and environmental sustainability in the seacoast community, Chambers, a research scientist and aquaculture specialist with the University of New Hampshire Cooperative Extension and NH Sea Grant, has spent the last six plus years raising and harvesting steelhead trout, blue mussels, dulse, and sugar kelp in a process known as integrated multitrophic aquaculture, which is science-speak for the careful maintenance of various marine species in optimal, symbiotic conditions. 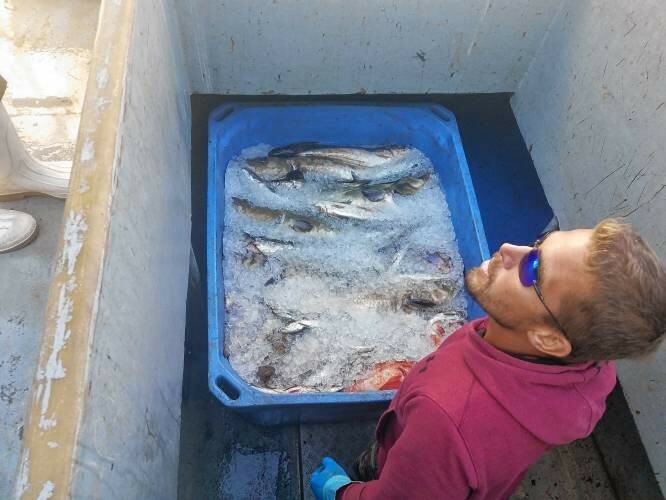 Last May, we reported on New Hampshire Community Seafood's effort to sign on at least 1,000 people for their community supported fishery, or CSF. A CSF is like a farm share, where subscribers can pick up seafood at various locations throughout the season. The push for new members was driven by a desire to support New Hampshire's ground fishermen. Their deadline was the end of summer, and with that now upon us, Andrea Tomlinson, manager of New Hampshire Community Seafood, joins NHPR's Peter Biello with an update. 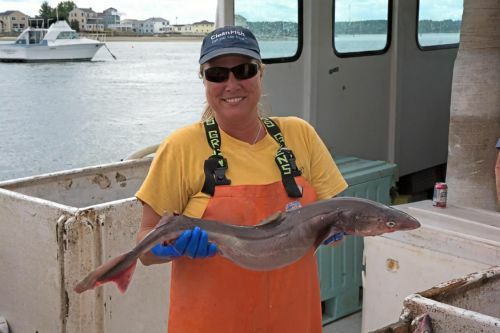 Andrea Tomlinson, the General Manager for N.H. Community Seafood, talks with us about how N.H. Sea Grant has helped her business and what the organization means to her. 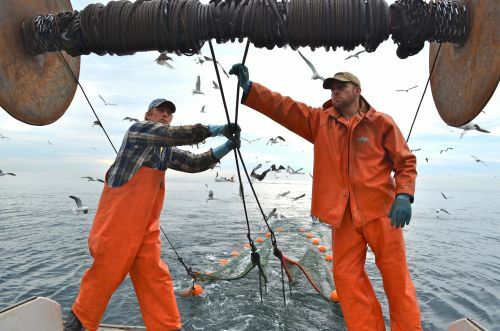 Commercial ground fishermen on the east coast are struggling--so much so that there's concern about whether they, and not the fish they catch, are an endangered species. An organization called New Hampshire Community Seafood is launching an effort to get more Granite Staters interested in eating local seafood, with the hope that it'll provide a boost to fishermen. For our series Foodstuffs, NHPR's Peter Biello reports. On a quiet and foggy morning, commercial lobster fishermen Lou Nardello pulls his boat into a dock in Seabrook. The 60-year-old first began fishing 35 years ago. After a long break, he recently returned to this line of work. The return of warm weather is sending commercial fishing boats back out into the ocean and re-awakening the growing local seafood movement, which seeks to help small fishermen, just as the local food movement has helped small farms. 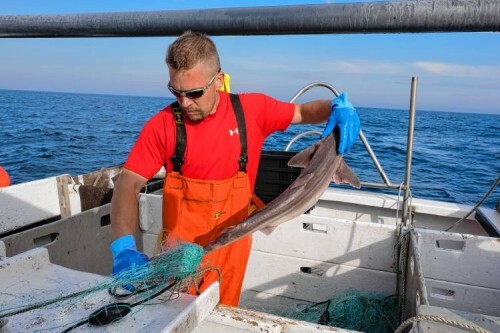 “Fishermen are facing many problems and this isn’t the only answer, but it helps,” said Erik Chapman, acting director of the N.H. Sea Grant program at the University of New Hampshire and a cofounder of LocalCatch.org, which coordinates hundreds of direct-to-consumer seafood operations around the world. 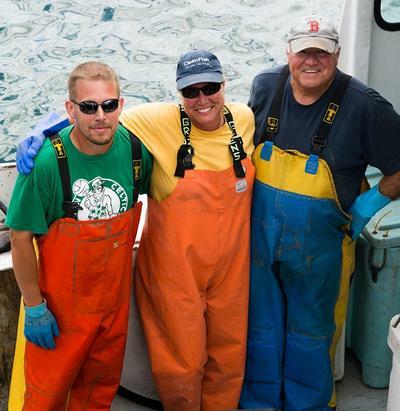 New Hampshire Community Seafood has set an ambitious goal of 1,000 Community Supported Fishery (CSF) members to keep NH’s few remaining commercial ground fishermen in business. 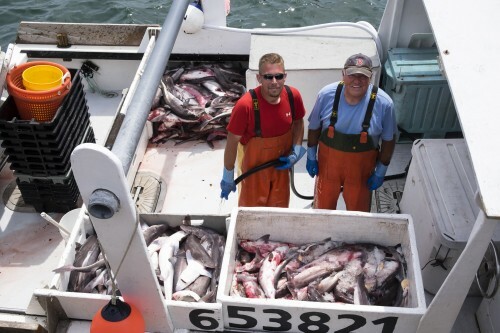 The CSF, a cooperative owned by Fishermen and consumers, offers residents a share of NH’s seafood catch at weekly pickup locations throughout the state and northern Massachusetts. By joining the CSF, community members provide direct support to fishermen in the form of higher income for their catch. Nine months into this food systems reporting gig where I’ve done everything from cuddling with a heritage pig to chomping on fresh-picked mustard greens, there’s been a lingering question that’s bugged me all along. 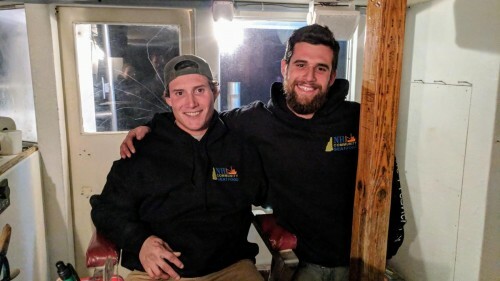 Along the seacoast, the Three River Farmers Alliance, a multifarm CSA and distribution outfit, recently pulled New Hampshire Community Seafood aboard its hub platform so it could market seafood alongside its collective menu of fresh produce and meats via a mobile app designed to work on both Apple and Android devices. 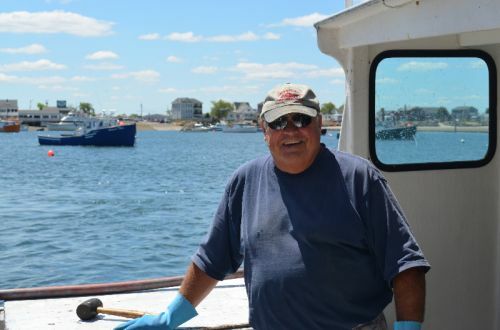 Politano is a member of New Hampshire Community Seafood (NHCS), a cooperative of fishermen and consumers who have joined together to support the state’s disappearing small-scale fishing industry and its sustainable harvesting practices. EXETER — If you like fresh seafood and want to help struggling New Hampshire fishermen survive, New Hampshire Community Seafood is worth considering. Currently signing up customers for its eight-week summer session, it’s a cooperative of fishermen and consumers working to protect what’s left of the local fishing fleet. “We have three boats out of New Hampshire," said David Goethel, a Hampton fisherman. "When we started with this we had 24. We had more than 100 boats back in 2000." Captain Tommy Lyons passes three tuna fishing boats as he heads out of Hampton Harbor toward the once-legendary fishing grounds of Jeffreys Ledge. Twenty-five years ago, when he first started fishing commercially, Lyons would see up to 700 boats around him on this trip. Now, as he starts hauling his gillnets that stretch out for almost half a mile, there are no other boats in sight. As a tour guide, Sara Mirabilio, North Carolina Sea Grant fisheries specialist, excels at spotlighting the state’s coast. In February, she led a seafood industry group on a whirlwind trip through Wanchese, Hatteras Island, Ocracoke and Carteret County. Participants hailed from the east and west coasts of the United States, the Great Lakes, Hawaii, and even Canada. Seafood and New England go together like peanut butter and jelly. In our country’s founding days, early Americans fished the bountiful seas and laid the foundation for a strong connection with the ocean and seafood that remains to this day. Leaving New Hampshire’s shores early in the morning in small 40-foot boats and returning in the afternoon to sell the day’s catch, groundfishermen seem to personify the state motto, “Live Free or Die.” But their numbers are shrinking. In communities across the country, a movement has sprouted up aimed at helping the local fishing industry create markets that deliver higher prices to fishermen for the fish they can catch. It doesn’t really bother David Goethel that farmers, not fishermen, have been elevated to rock star status across the Seacoast’s local food movement. Goethel has weathered the vicissitudes of fortune as a New Hampshire fisherman from the helm of the Ellen Diane, the 44-foot dragger he’s captained since he had her built in 1982. He’s ridden the waves of ground fishery regulation; from the flow of past daily allowable catch rates to the ebb of current sector management schemes that apportion quotas to New England fisherman. David Goethel has been fishing since 1981. Now 61, Goethel was hoping to keep going out in his boat, the Ellen Diane, out of Hampton Harbor, well into his mid-60s. But new regulations on the amount of cod commercial fishermen can catch might mean an early retirement for Goethel. He hasn’t fished since November of last year and the new regulations, which went into effect in May and will continue through April of 2016, could mean a short season this year. New Hampshire and New England have been firmly on the local and sustainable food bandwagon for years now, and although Granite Staters are also enthusiastic consumers of seafood, it hasn't been until recently that some in the state have tried to bring that local sensibility to the fish they eat. Cod played an important role in the history of New England. Native American indians new of this valuable resource and it was a vitally important part of their diet. Evidence of this can be found in middens (old dump for domestic waste). It was believed that in 1621 while the pilgrims where starving, the native indians believing they would “receive blessings” showed the pilgrims how to catch cod and use the uneaten parts for fertilizer. The indians also introduced the pilgrims to quahogs, steamers, and lobster which they eventually ate out of desperation. Some say because of this introduction of cod to the pilgrims it opened up negotiations with the indians which eventually led to our modern day Thanksgiving. Because of the state of the fishing industry today, small fishermen find themselves squeezed between massive international fleets and heavily depleted stocks. In their fight for survival, many are finding themselves becoming both educators and advocates along the way. In grappling with these forces and trying to find a way to keep afloat, they may have just hit on a key principle that lies at the heart of the sustainability journey. New Hampshire Community Seafood has returned for its second year. NH fishermen experienced a 78% cut in the groundfish quota allowed in 2013, along with low lobster prices and increasing costs of fuel and bait. At the same time, 98% of the groundfish landed in NH normally leaves the state with most being sold for low prices at commercial fish auctions. These factors put the New Hampshire fishing industry in a precarious position with its survival threatened. Recently, a letter to the editor was published in the Portsmouth Herald that criticized the annual N.H. Fish and Lobster Festival, known locally as the “Fishtival,” for promoting the use of dogfish in local menus. A community-supported fishery has spread its net from Portsmouth to Peterborough since June. 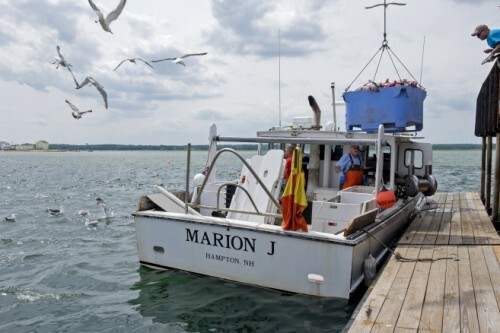 Owners of fishing boats from Seabrook, Hampton, Rye Harbor and Portsmouth Harbor first organized to get fresh, locally caught fish to Seacoast residents, according to Sarah VanHorn, general manager of New Hampshire Community Seafood. PORTSMOUTH — U.S. Sen. Jeanne Shaheen addressed the impact of reduced cod populations in the fishing industry and her hopes to secure $150 million in federal disaster relief funds for coastal communities across New England in a visit Thursday at the state Fishing Pier. PORTSMOUTH — Sen. Jeanne Shaheen, D-NH, was at the commercial fishing pier on Thursday to hear about the many challenges the local fishing industry faces, how Congress can help, and what the fishermen are doing to try and save themselves. U.S. Sen. Jeanne Shaheen, D-N.H., met with fishermen in New Hampshire on Thursday to hear their concerns about the industry. PORTSMOUTH — Eleven months after the U.S. Department of Commerce declared a disaster for the Northeast commercial fishing industry, fishermen have yet to see any money to help alleviate their financial hardship. New Hampshire Community Seafood wants to give Granite Staters access to fresh fish, and is offering shares in a community supported fishery. Fishing boats from Seabrook, Hampton, Rye Harbor and Portsmouth Harbor — 14 fishermen and their crew — have decided to organize a harvest cooperative, according to Sarah E. VanHorn, general manager of New Hampshire Community Seafood. UNH is a place that provides the culture to cultivate your ideas and dreams, and realize them through real-world opportunities. Go beyond the classroom at the University of New Hampshire.